What are the Human Hair wefts used for? Human Hair wefts are used to make dread extensions to lengthen existing dreads or they can be used to repair weak or thin spots in existing dreads. If we don't stock the exact colour, length or thickness of pre made dread extensions that you need then the DIY Human Hair Weft Kit allows you to make them yourself to suit your exact requirements. If you are about to install dreads in your own hair, an alternative to making separate extensions is to add extra human hair as you go. Whilst you are backcombing and crocheting down the length of a section, add small bundles of hair from the weft to the backcombed section and crochet it in place to form the additional length of the dread. Effectively, you are building length with additional human hair. This technique is a little trickier than making separate extensions. What colours are available & can they be dyed? We generally stock Human Hair wefts in Blonde and Mid Brown. Human hair can be dyed, however, since it has been chemically treated results are unreliable and a professional colourist should be consulted for this. We may also be able to order in a specific colour so please send us a message and we will do our best to cater to your request. How do I make my own extensions and install them? Start by cutting the length of weft required and securing it in place with string or yarn. 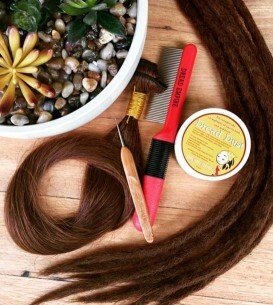 Apply Dread Dust to the section of hair and then start back combing, letting only a few hair strands move up at a time. Once you have created a backcombing fuzz ball, swap over to crocheting and re work that section of hair, caputuring the loose hairs and pulling them into the dreadlock. Alternate between backcombing and crocheting as you work your way to the end of the dreadlock. Now that the extension is made, cut the weft off and fan out about 1 inch of hair at the top of the extension. Use the Dreading Hook to crochet the extension around the end of your real dreadlock. The below video provides a detailed demonstration of extension creation and attachment. How do I repair existing dreads with a hair weft? Human hair can also be used to repair weak or thin spots in existing dreads. Start by taking a very small bundle of human hair from the weft. Rub it between your fingers to tease it a little. The Dread Dust can assist in teasing it quickly and it also helps the hair bind to the dreadlock. Now place the teased section of hair over the damaged part of the dreadlock and use a crochet hook to pull it into the dread. You may wish to repeat this in order to build up thickness to the required level.